Would I travel across town during a Minnesota winter weather advisory to crowd into the Cedar and stand in the back of the room, craning my neck for glimpses of the band? I would if the band included Brian Blade, and did. 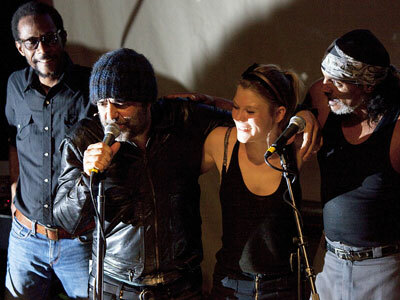 I learned earlier this week that Blade would be in town as part of Black Dub, Daniel Lanois’ latest project. Until now I have only heard Blade play jazz, “only” in this case being a word as big as the sun, given the people he plays with (Wayne Shorter, his own Fellowship Band) and has played with (Herbie Hancock, Joshua Redman, Kenny Garrett, Bill Frisell, Chris Potter, Chick Corea and Christian McBride). Before last night, my latest Blade sighting was at the Monterey Jazz Festival with Billy Childs. Lanois describes Black Dub as “kind of a rock thing, steeped in the Jamaican culture of dub.” I know little about dub but noticed a lot of rock, some country and blues in the part of the show we arrived in time for. By then the Cedar was SRO (the band had specified fewer than usual chairs; they wanted a standing crowd) and steamy hot. On stage were Lanois on guitar, Trixie Whitley (daughter of the late blues artist Chris Whitley) on vocals, Jim Wilson on bass, and Blade on drums. This was the final date of their current tour, the night before Thanksgiving, and the vibe was relaxed and festive—music among friends. (Lanois produced Blade’s first Fellowship Band CD in 1998; he had a long friendship with Whitley’s father.) The sound was both luscious and gritty, with Lanois taking turns on Gibson guitar and pedal steel, adding distortion, delay, and thickness. Whitley, only 23 and thin as a stick, exuded confidence, moving from mic (where she belted, moaned, and growled) to guitar, from keyboard to drums, at times playing side-by-side with Blade. Wilson, standing in for the group’s regular bassist, Daryl Johnson, kept things grounded. We heard something by the Stones (was it “Beast of Burden”? I thought I would remember but I don’t) and tunes from the eponymous Black Dub debut including “Ring the Alarm” and “Silverado” (which Lanois introduced as “a song about companionship”). Also Whitley’s “I’d Rather Go Blind,” not a remake of the Etta James tune (“I would rather go blind/Than to see you walk away from me”) but her own original (“I’d rather go blind/Than be this misunderstood”), and the classic Lanois tune “The Maker,” which ended the night and sent us back into the snow. I had a decent view of Blade, both from where I was standing and thanks to the live video projection (in black-and-white) on the wall at the back of the stage. I have mostly heard him acoustic, not amplified, so this was bigger and louder (and sometimes a bit murkier? The dub thing?) but still fascinating. He’s a dancer at the drum kit, and a preacher (like his dad), and a collaborator, laying down rhythms, adding cymbal splashes, leading with a beat, sometimes delicate, sometimes pounding and bombastic. To me, his playing is full of emotion and sincerity, inventiveness and intelligence, logic and surprises; he always knows precisely the right thing to play, yet I can never anticipate what he'll do next. I think most people were probably there for Lanois, whose production credits include everyone from U2 to Peter Gabriel, Bob Dylan, the Neville Brothers, and Neil Young, but for me it was all about the man behind the drums. Here’s a studio recording of “Ring the Alarm.” Awesome Brian Blade action. Lots more on the Official Daniel Lanois channel. Thanks for posting this Pamela. I am in Mexico with Todd Clouser and am SO BUMMED I MISSED THIS. Lanois is possibly one of my favorite musicians on the planet and his album 'Shine' is easily a desert island pick for me. Check it out when you get the chance. Thanks, Chris. We saw your brother there, and Paul Metsa. I just ordered "Shine."